Yes, I’m Against The Death Penalty. Unless You’re A Tick. I wrestle with high-profile, controversial, ethics shaking topics here on my blog. That’s because I wrestle with those very same topics in my heart. Spiders or the occasional scorpion in the house? I capture it and set it free outside. My boys inexplicable fascination with guns and swords? They are basement toys where I can pretend that kind of play doesn’t exist. I honestly felt (notice the foreshadowing here) that I couldn’t kill. Anything. “What is that on your ear?” I said to my son. Looking more closely, it just looked like a piece of leaf. I flick it with my finger but it stays firmly attached. I grab my reading glasses (yes, I’m that old) and take a closer look. It’s a piece of a leaf with legs. Hey, that isn’t right. “Come with me,” and I grab his arm and drag him into my bathroom. Thoughts of drowning with baby oil, petroleum jelly and use of matches race through my mind (all wrong, by the way) but all I really want to do is get that thing off of him. I grab my tweezers and pluck that little sucker off. I swab the area with rubbing alcohol and breathe a sigh of relief. Then, something in my memory jogs. You’re supposed to save the disease carrying culprit. So, I lock him up safely in a Ziploc bag. This maneuver intrigues my boys. They take turns carrying him around and examining him. My daughter, angered that something would dare hurt her little brother says, “Let me see that!” and she shakes the bag, disorienting the poor little bugger. “That’s for hurting my brother!” she says. Apparently, that’s an activity only she can partake. I search online, frantic that I may have done the wrong thing. (I haven’t) Thank goodness. (Click here for a step-by-step guide) I did exactly as I should have. I even saved the evidence for a call to the doctor in the morning. When my husband comes home I tell him of our ordeal. He has dealt with Lyme disease before in his practice. I tell him I’ve saved the tick. Hmmm, really? Online it says to preserve/kill it with rubbing alcohol. We just put him in a Ziploc baggie, letting him suffocate and squirm. He’s not even close to death. I go into the bathroom and feel a little giddy. The little angel on my left shoulder chastises me and I feel a bit guilty. 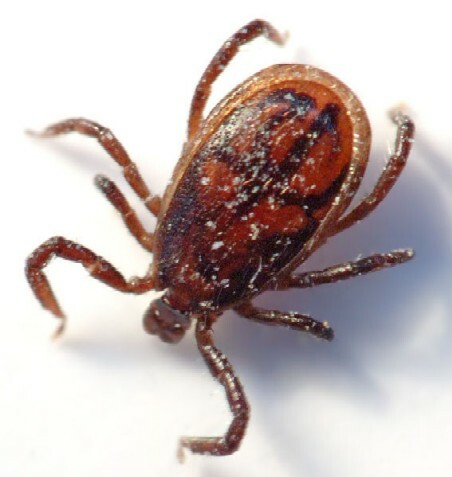 Then, the little devil on my right shoulder shouts, “But he tried to give your baby Lyme disease!” And without the slightest hesitation I pour a few glugs of the vile liquid into the bag. The menacing tick stops squirming. One little leg gives a final surrender and he’s dead. I try to hide my satisfaction. I suppress an evil grin. But my little angel shakes a finger at me, reminding me that I’ve just administered the death penalty without the benefit of a judge and jury. He tried to hurt my child.